Even though I made the bread late, I am so happy I did them as they are sooooooooo DELICIOUS. We loved it. These days Hans is trying to less is intake of Carb in the evening and trying to eat lighter food as possible on weekdays. So I made this bread on a weekday, and as you know my niece come here for having her food, I thought atleast I can bribe her for eating this bialys with her soup. 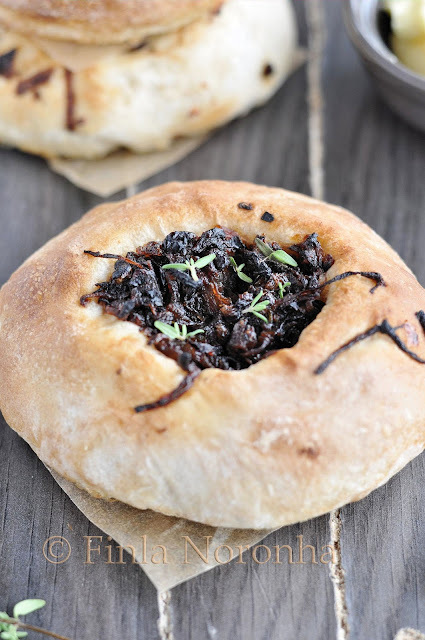 So niece came in the evneing and ofcourse she said she will eat one and they were so yummy we ate 3 all together, we would have ate the fourth one too but both of us felt guilty , if we eat the fourth one Hans wouldn't have a chance to eat the delicious bialy. I will try them again as it is not a difficult to make, I think the only think which is a bit tricky to make is the shape. In the meanwhile, make the filling. Heat the oil in a large frying pan. Add the onions stir and cover with a lid and cook in a low heat stirring now and then. After the 20 minutes add the onions and thyme. Fry everything for another 10 minutes stirring now and then. Add the sugar and vingear and fry everything in a high heat for futher 7 to 8 minutes stirring and taking care that the onion mixture doesn't burn at this stage. Add the mixture in to a bowl and leave it to cool before you use it. Sprinkle your work surface lightly with flour and place the dough on it. Divide it into 8 equal pieces and shape each one into a roll by flattening it and then pinching the ends together to form a smooth ball. Place the rolls on a lightly greased baking sheet and cover them with a towel. Let them rise for about one hour (about 1 1/2 to 2 hours for refrigerated dough) till pressing with a finger on the top leaves a dent. Bake the Bialys at 230C (450F) for about 15 minutes till they’re golden brown in colour. Cool them on a rack. Serve slightly warm or at room temperature. This recipe makes 8 largish Bialys. I also sprinkled a bit of feta cheese in half of the bialys. 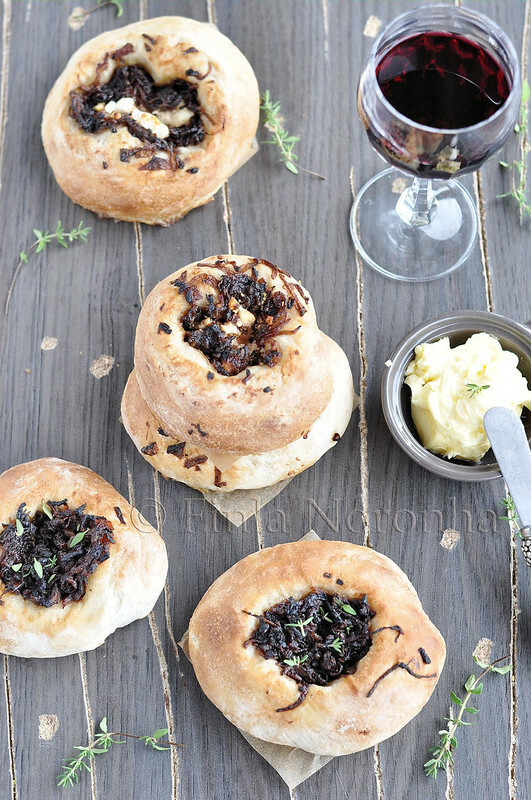 These savoury buns with caramelized onions look fascinating! 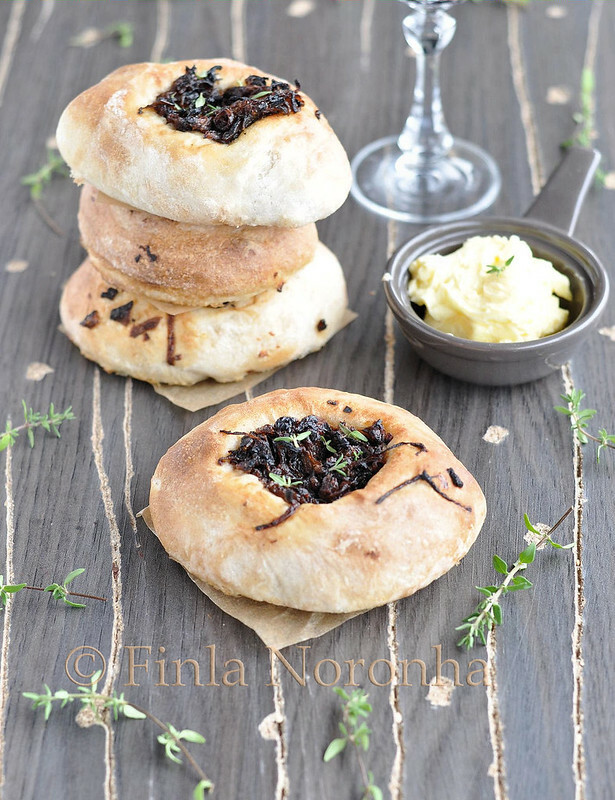 I love these Finla and what beauty look these rolls I love the pictures! They do look like bagels but on the softer side. Certainly looks delicious and with the onion filling definitely so. I liked reading this post. I've been seeing this on the blogs and thought it would be sweet but I see in your recipe it's just 1 tbsp for 3 cups of flour.